Although this might work as expected it has a problem of its own - there is tight coupling between Class1 and its dependencies (Class2 and Class3). If you wish to replace Class2 and Class3 with some other implementations you need to change the code of Class1 since these objects are created inside the class. Base Class2 and Class3 on some interface. Supply objects of classes implementing the interface (Class2 and Class3 in this case) from external world. Ok. Now that you have some idea about DI, let's see how ASP.NET Core 1.0 allows you to work with it. It instantiates an object of the said service and supplies it to controllers. The dependencies can be injected through constructor injection or through property injection. It handles the lifetime (when to create an object and when to dispose it) of the injected object. Singleton : An object of a service is created and supplied to all the requests to that service. So, basically all requests get the same object to work with. Scoped : An object of a service is created for each and every request. So, each request gets its a new instance of a service to work with. Transient : An object of a service is created every time an object is requested. Let's see how each of these modes work. The MyServiceInterface class defines a single property - UniqueID. The MyService class implements IMyServiceInterface. The UniqueID property is set to a new GUID in the constructor of the MyService class. This way you can observe the value of UniqueID to understand the lifetime modes mentioned above. Then add HomeController and Index view to the project. Notice the line marked in bold letters. It uses the AddSingleton() method of the IServiceCollection to register MyService class as a service type. As the name suggests AddSingleton() method registers MyService with singleton mode. The HomeController constructor takes a parameter of IMyServiceInterface. Since a type that implements this interface is registered with the DI framework, an object of MyService is created and supplied to the constructor. The object reference is stored in a local obj variable for later use. Now open another browser tab and issue another request to /home/index. You will find that both the tabs output the same UniqueID confirming that a singleton object is being created. This time the code uses AddScoped() method. After making this change run the application again. Simulate multiple requests as before. This time you will find that each tab displays different UniqueID. This conforms that each request is being supplied with a new object instance. This time the HomeController declares two variables of IMyServiceInterface. 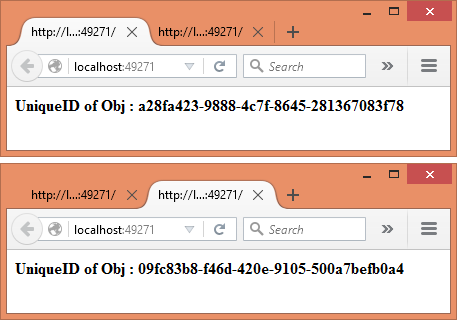 The constructor accepts two parameters of IMyServiceInterface - obj1 and obj2. This is just to simulate multiple object creation requests. The obj1 and obj2 are stored in ViewBag as before. To test the transient mode, run the application. You will find that the two UniqueID values are different even for a single HTTP request. As you can see, the code creates an object of MyService instead of relying on DI framework. This manually created object instance is then registered with the DI framework using an overload of AddSingleton() method. Notice that this overload accepts an object instance that is then registered as a singleton instance with the system. You can run the application as before. You will observe that instance mode works like singleton lifetime mode - the same object instance is supplied to all the requests.